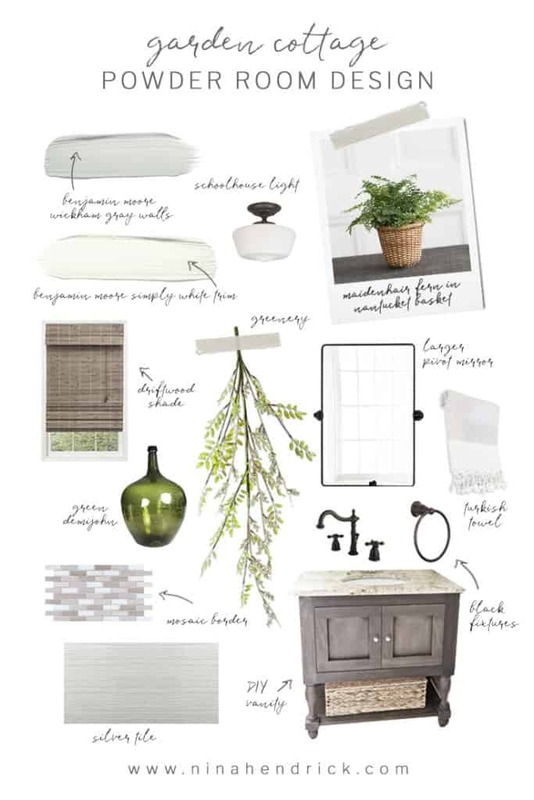 This cottage powder room inspiration and mood board is full of bathroom decor ideas that can help you make a big style statement, even in a small bathroom. What happens when you’ve already completed a project but you begin to feel like it’s already time to go back and revisit the design? If you are my husband, the answer is “Tell yourself you’re crazy and leave it alone”. If you know me at all, you probably know that this was not possible. Once an idea takes root, that’s the end of it. I’m going to share how you can “edit” a room. In this case, we will take a small bathroom and make some simple changes to get it to where we want it to be. Five years have passed since we began to tackle this space. If you are just joining me here on this blog, first of all- welcome! Second, if you are interested in seeing the before and reading about the DIY projects that we did in this room five years ago (like the vanity and ceiling), all of those posts are available here. 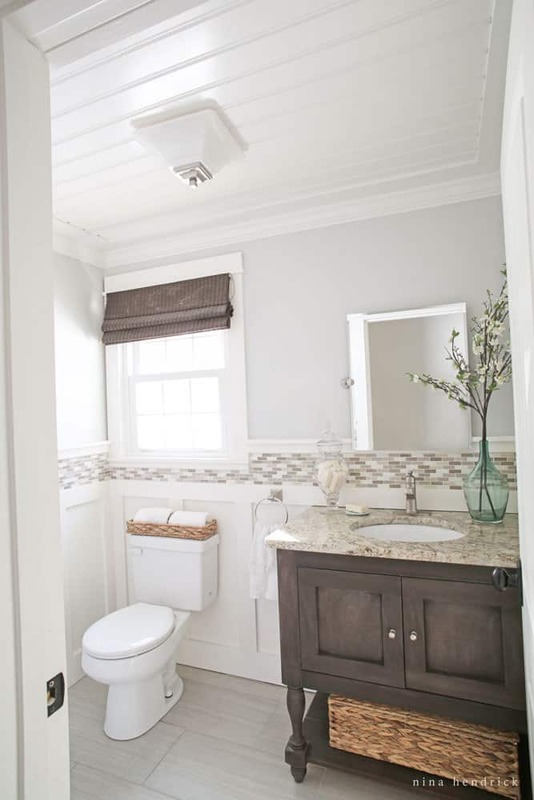 While this powder bathroom is perfectly lovely, there are a few tweaks I am ready to make. I did the original project on an extremely tight budget. To save money, I used leftover fixtures from my father-in-law’s new house build. As a result, the fixtures weren’t exactly what I would have chosen, although they were fine and served us well. However, now I’m ready to take it up a level. I know my style really well now and have a mental bank of ideas to pull from on how I want to improve some details of the room. One thing I knew for sure that I wanted was a larger scale mirror. I love the board-and-batten wall treatment, but it did complicate our ability to install a mirror on the wall. I found the best solution I could with the mirror I chose at the time. However, the mirror was a bit small for the size of the vanity and the wall. Now there are a lot more options with brackets that better fit both my style and the more traditional country mix in the rest of our home. Speaking of my style, there were a few other changes I knew I wanted to make. The square elements of the fixtures was always a bit more modern than I would have chosen. I also love dark hardware to contrast the light finishes in our home. I do want to mention that the current fixtures aren’t going to waste. We are planning another powder bathroom for our basement. It will be primarily for our boys and their friends to use. These fixtures will serve that room well! So, we had to buy fixtures either way, so I chose to put them in the bathroom that we and our guests see the most often.